Pre- Engineered Buildings are on the average 30% lighter through the efficient use of steel. Primary framing members are tapered (varying depth) built- up sections, with large depths in the areas of highest stress. Secondary members are light gage (light weight) roll- formed (low labour cost)"Z or "C"' shaped members. Quick and efficient; since PEBs are mainly formed of standard sections and connections, design time is significantly reduced. Basic design, based on international design standards and codes, are used over and over. Specialized computer analysis and design programs optimize material required. Drafting is also computerized using standard details that minimize the use of project custom details. Design, shop detail sketches and erection drawings are supplied free of charge by the manufacturer. PEB engineers design and details pre-engineered buildings almost every day throughout the year resulting in faster and more efficient designs. Consultant's in-house design and drafting time is considerably reduced, allowing more time for co-ordination and review and reduction in design fees. Both costs and time of erection are accurately known based upon extensive experience with similar buildings. PEBs are often erected by specialized PEB builders with extensive experience in the erection of similar buildings, offering very competitive rates. PEB builders usually have a stock of standard components; enabling them to complete jobs on time should any shortage or site damage occur to materials. The erection process is easy, fast, step by step and with hardly any requirement for equipment. A Pre Engineered Building (PEB) is designed by a manufacturer to be fabricated using a pre-determined inventory of raw materials and manufacturing methods that can efficiently satisfy a wide range of structural and aesthetic design requirements. It can be as unique as we need. A computer-assisted design helps create a building for a specific use, whether it's a service station, manufacturing, retail outlet or office building. 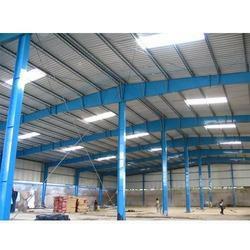 These buildings are specified majorly for commercial, Institutional or Industrial Occupancies. They feature a structural steel framework of primary and secondary members (rigid frame, purlins and girts) on to which cladding and roofing components are attached. The complete building system is pre-engineered to facilitate easy production and assembly on site. Lower life cycle costs for greater return on investment. Pre Engineered Building offered comprise a wide range of steel structure buildings that are developed in light steel structure to high-rise steel structure options. 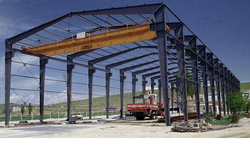 Pioneer India is also the most recognized manufacturer of metal building systems. Pioneer provides high quality solutions for all kinds of pre engineering building requirements and superstructure. The Pioneer products have been used in buildings over the country and beyond due to their matchless quality. Pioneer India is offering metal building systems, metal building systems in india, pre engineering building requirements, pre engineering building superstructure as the leading metal building systems manufacturer. 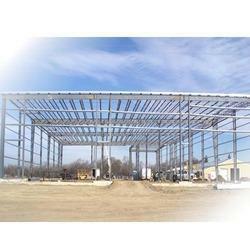 Prefabricated Steel Building offered comes in quality construction finish and provides for easy installation support. Note:- Price starting range from Rs. 189/- up to RS. 299/-. Our company, Pioneer India manufactures and supplies a range of pre-fabricated steel buildings to a number of industrial requirements. 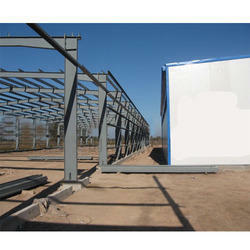 These are provided with factory finished cold formed flashings. Trims and capping like barge board, drip-ends, corners, ridge capping, gutters, apron flashing etc. The company also gives out roof monitor, ridge – vents, ventilators, contour matched skylight panels in FRP polycarbonate, foam fillers, rood-curbs, etc. according the requirement produced by clients. Pioneer India is offering prefabricated steel buildings in India, prefabricated metal buildings in India being the most trusted prefabricated steel buildings manufacturer . Roofing in Industrial, commercial, residential and a variety of other markets. Available in wide range of Galvalume pre-painted galvanized steel. 550 mpa y/s steel, L/150 Deflection, Data for other grades available on request. 240 mpa steel, U250 Deflection criteria. Dimensions & properties are typical, nominal & are indicative subject to standard tolerances & material specs. BMT is base - metal thk. Coating thk. to be added for TCT. Safe-loads are UDL-Kgs/Sqm for Single-span/Double-span/Multi-span conditions. Simple design, easy to construct and light weight. Since the connections of the components are standard, the learning curve of erection for each subsequent project is faster. 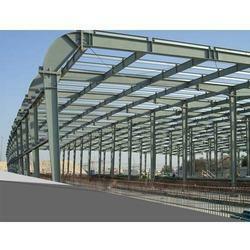 Periodic free of charge erection support at the site is usually provided by PEB manufacturers. The low-weight flexible frames offer higher resistance to seismic forces. Price per square meter may be as much as 30% lower than conventional steel. Outstanding architectural design can be achieved at low cost using standard architectural features and interface details. Traditional wall and fascia materials, such as concrete, masonry and wood, can be utilized. Building is supplied complete with cladding and all accessories, including erection (if desired), from a single one stop"
PEB Manufacturers usually stock a large amount of basic raw materials that can be flexibly used in many types of PE B projects. Change orders are easily accommodated at all stages of the order fulfillment process. Little or no material is wasted even if a change order is made after fabrication starts. II project records are safely and orderly kept in electronic format indefinitely, making it easy for the owner or designer to obtain a copy of his building records at any time. Future expansion is simple, easy and cost effective. One supplier can coordinate changes. Single source of supply results in total responsibility by one supplier, including design liability. PEB manufacturers can be relied upon to service their buildings, long after they are supplied, o protect \ their reputation. All components have been specified and designed specially to act together as a system for maximum efficiency precise fit and peak performance in the held. Experience with similar buildings, in actual field conditions worldwide, has resulted in design improvements over time, which allow dependable prediction of performance. Components are custom designed for a specific application on a specific job. Design and detailing errors are possible when assembling the diverse components into unique buildings. Each building design is unique, so prediction of how components will perform together is uncertain. Material which have performed well in some climates may not do so in other environments. Primary steel members are selected from Prefabricated Steel Buildings standard hot rolled "I" section which are, in many segment of the members, heavier than what is actually required by design. Members have constant cross- sections regardless of the varying magnitude of the local (internal) stresses along the member length. Secondary members are selected from standard hot rolled "I" or "C" sections, which are heavier. Each conventional steel structure is designed from scratch by the consultant, with fewer design aids available to the Engineer. Extensive amount of consultant time is devoted to design and drafting, as well as co-ordination and review, often resulting in a significant expense. As each project is a separate case, engineers need more time to develop the designs and detail's of the unique structure. More complicated design, requiring extensive design and drafting time from consultants. Erection is slow and extensive field labor is required. Heavy equipments is often needed. The connections are normally complicated and differ from project to project, resulting in longer learning curves of erection for new projects. Rigid heavy weight structures do not perform well in seismic zones. Higher price per square meter. Many sources of supply considerable: project management time is required to co ordinate suppliers and sub contractors. Substitution of hot rolled sections, which are infrequently rolled by mills, is expensive and time consuming. Change orders that are made, after hot rolled sections are shipped for fabrication, often result in redundancies to a lot of hot rolled sections, which ultimately result in more cost to the enduser. Every project requires special design for accessories and special sourcing for each item. Flashing and trims must be uniquely designed and fabricated. It would be difficult to obtain project records, after a long period of time. It is required to contact more than one party, involved in the project, to obtain accurate information. Future expansion would be more difficult and more likely costlier. Multiple Responsibilities can result in questions of who is responsible when components do not fit properly, insufficient material is supplied, or material fail to perform, particularly at the supplier/ contractor interface. The consultant carries total design liability. To meet the diversified requirements of our prestigious clients, we are offering Pre Engineered Building Secondry Systems. This building system is accurately designed with supreme quality high grade steel plates with minimum yield strength under the supervision of experts and leading techniques. The offered building system can be availed in several specifications as per the demand of the customers. In Pre Engineered Building Primary Systems, mill-produced hot rolled sections (beams and columns) are used. The site of each member is selected on the basis of the maximum internal stress in the member. Since a hot rolled section has a constant depth, many parts of the member (represented by the hatched area), in areas of low internal stresses, are in excess of design requirements. Frames of pre-engineered buildings are made from an extensive inventory of standard steel plates stocked by the FEB manufacturer. FEB frames are normally tapered and often have flanges and webs of variable thickness along the individual members. The frame geometry matches the shape of the internal stress (bending moment) diagram thus optimising material usage and reducing the total weight of the structure. 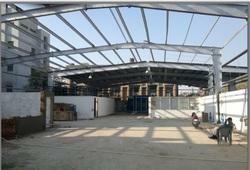 Fascia, Canopies, Louvers, Skylights, Crane Gantry, Falst Ceilings, Mezzanine, Turbovents.